Vintage bathing suits re purposed as art seem to have popped up everywhere I turn. I'm not usually a trend person but I'm absolutely loving it. 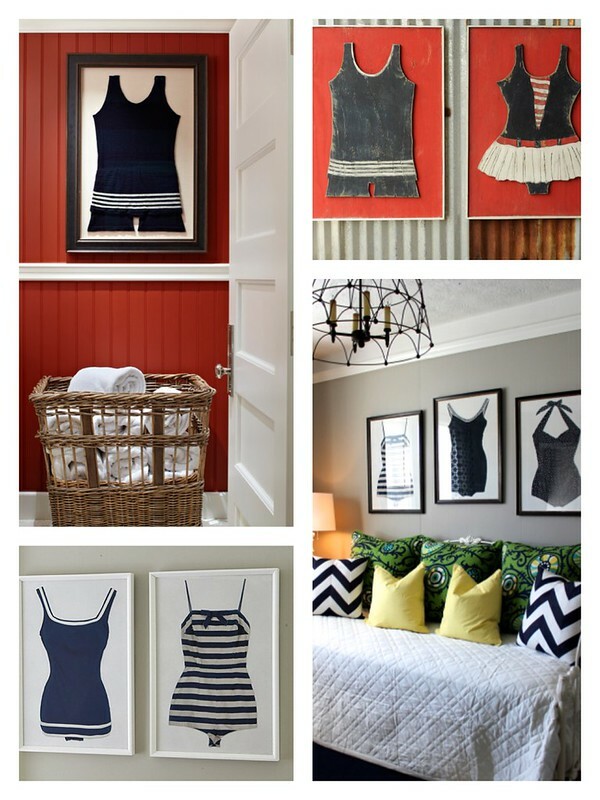 Whether its an actual vintage bathing suit framed, a photograph, a painting or a wood cut out, I'm smitten. As a "water girl" I love them, too. Thanks for sharing the links. We have a pool and I would love one for my stairwell. I <3 vintage, with a special fondness for the 30's and 40's. I have been smitten with the vintage beach pajamas that were popular in the 1930's with the wide legged pants. I love this idea of framing a vintage suit. Maybe I'll peruse Etsy for one to frame....Fabulous! How did I not know that there were such a thing as swimming pajamas?? Love this! I love it! I've actually saved both kids' first swimsuit and plan to frame them. Have you seen the BHG shot of the suits on a green wallpapered hallway? LOVE! That is so smart! I would have never thought about framing my daughters first swimsuit...maybe I should have picked one more in line with decor? I feel like your shore place NEEDS some of this art!!! Yep, I'm with you! I was thinking of trying to paint my own or maybe just frame some reproductions? I dont think it looks as cool when the material isn't completely flat which is a hard one to master though. Are you ever going to show us the playhouse?? I definitely will but I'll have to wait for a good weather weekend day to actually photograph it - but its definitely coming soon! Um, this sounds like the perfect art for your shore condo! I love the curvy silhouettes of the old-timey suits. Yes, thats where my head is at lately. I'm considering trying to paint one but I'm not sure if I have the skills. Might be worth a shot though. We have lovely vintage swimwear in out store. Check glamoursurf.com for all your vintage realated beach needs. Thats super cute-- and I love it paired with those chevron pillows.